FTC Complaint: New Tucson Land Fraud, Etc. I’ve been studying the Federal Trade Commission Complaint against Horizon Corporation, which was responsible for developing New Tucson, key words to search in the 500-page document is “improvement.” It appears from the Complaint that Horizon deceived buyers into thinking there would be improvements on their lots. Pima County no longer approves a subdivision without utilities and roads. 14. In the further course and conduct of the aforesaid business respondent has made and is making various statements and representations to members of the public, by means of advertisements in various publications of general circulation, promotional materials TV and radio broadcasts, telephone calls and sales presentations involving oral statements, written statements movies and slides concerning the past, present, and future development of respondent’s properties, and inclusiveness of the purchase price of a lot. The aforesaid statements and representations use words and terms such as communities, “community developer,” “master plan,” “land use plan,” “new cities” and other words or terms of similar import. 15. By and through the statements and representations alleged in Paragraph 14 herein, respondent has represented and is representing, directly or by implication, that substantially all lots are now, or by approximately the end of the purchaser’s scheduled payments will be, located within a self-contained and fully developed community, and that the price of the aforesaid lots is all-inclusive. There are laws in other states about how much you can charge in a special assessment. How do you expect some of us to come up with HUGE special assessments. California law limits the amount of special assessments to 5% to the annual budget. See also this. (b) Elimination from such by-laws and articles any powers, such as to extend utility lines, which the association has not and is not likely to use because of adverse effects on its non-taxable status. (c) Postponement of the annual charges and assessments by each undeveloped lot owner until such time as water, sewer and electric utilities are in place in the street in front of each lot, or until such time as the utilities have been contracted for and the date of installation is certain. Based on the FTC Complaint, it appears that the judge made an error in deciding against the County in New Tucson Unit No. 8 Homeowners Association v Pima County: C20041194. The judge in the above case should have allowed the majority lot owners to do what they wanted with their lots and NOT involve the minority lot owners in their development, i.e., it doesn’t cost the majority lot owners much more to provide utilities and roads for all the lots. In Unit 4, someone provided electricity & water to my lot there for free! You should allow me to quiet title against Mr. Sullivan [a sucker who bought $400,000 worth of Special Assessments on 8 of my lots] as I told you in October I planned to do. 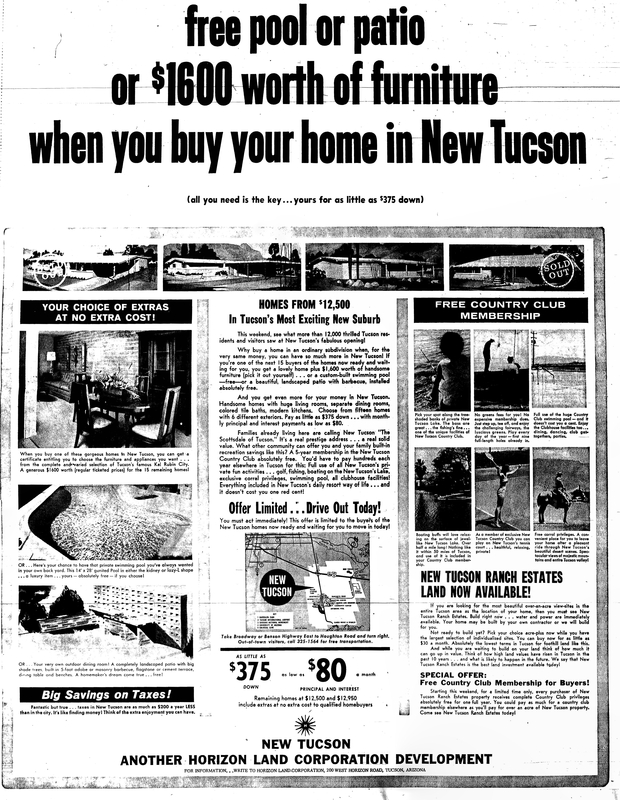 New Tucson, Horizon Land Corporation ad, Tucson Citizen, 24 January 1964, p.28 *** Click pic to enlarge, you can read it. I urge you to reconsider your actions and to immediately call a meeting of all members of the HOA to determine our future — such as extinguishing all the expired liens and a discussion on further assessments and dues for vacant lot owners. This entry was posted in Uncategorized and tagged Arizona, Corona de Tucson, Federal Trade Commission, FTC, Horizon land Corporation. Advertisement, Land Fraud, New Tucson, Subdivision, Sycamore Vista HOA. Bookmark the permalink. 1 Response to FTC Complaint: New Tucson Land Fraud, Etc.